Olympos is a science fiction novel by the award winning author Dan Simmons. It's strange how something good, can be turned by it's association with something bad. 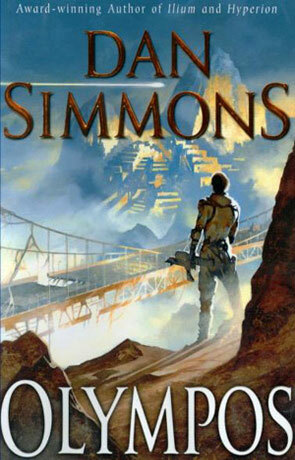 I really loved the first volume in Dan Simmons Ilium/Olympos saga. I really did. But after having read the second volume Olympos, it's hard for me to remember what exactly was so great about it. In other words Olympos stinks, and the stench is so bad that it reaches backwards in time and taints the Ilium volume. I'll try not to spoil anything, if for some reason, you would want to read these two books, but it's kind of hard not to touch a bit upon the ending as it's such a large part of the problem. Basically Olympos is more of the same of what we got in Ilium. The old Greek gods still fight around Ilium and Olympus, sometimes among them self, sometimes on the side of various humans. Strange quantum things happens. The old-style people of earth are getting massacred. The post-humans has a hand in everything. And more quantum things happen. And slowly, somewhere half way through Olympos, you start to get the feeling that nothing, that has happened until then, really matters. Simmons managed to paint himself into a corner. The usage of quantum magic (because that's what it is in this book) becomes so strong, that all plot lines could be fairly easily fixed by just saying “and the quantum master made it so”. I'm fairly sure that Simmons became aware of this himself, somewhere along the way, as the ending smell badly of quick wrap up. So many questions posed in the first volume is either answered with a hand wave or just left unanswered. Probably the worst I've ever read by Simmons. Very disappointing. Written on 3rd December 2005 by TC.